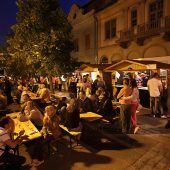 The town, situated some 80 kilometres northeast of Budapest is the cultural, economic and touristic centre of the Mátra region. The name of the settlement was first mentioned as ’Gungus’ in 1261, and in 1334 it was given market town status by the Anjou king Charles Robert, and was granted privileges. Viniculture and wine production, trade routes leading through the town and a steady market set the town on a road of fast development, which was also aided by the Franciscan Order that had moved into the town in the 14th century. 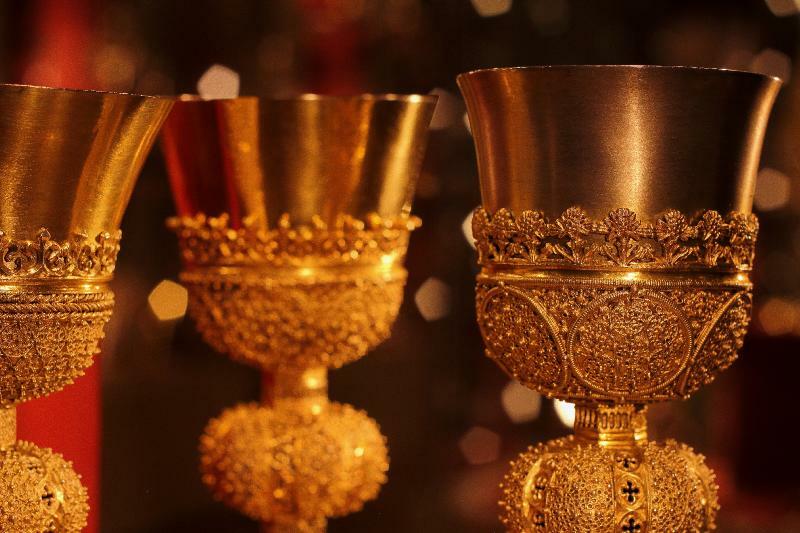 Between 1546 and 1687 Gyöngyös was under Turkish rule, buta s a personal property to the sultan it became more protected, and as a consequence, viniculture, wine production and trade, especially wine trade, could flourish on. Trade guilds appeared at the beginning of the 17th century. The town played an important role during the Rákóczi Insurrection between the years of 1703 and 1705, but this did not bring a halt int he town’s development that started after the Turks had been banished. By that time, edifices built in baroque style characterized the town’s image. Gyöngyös and its sorrundings were severaly affected by philoxera, which was ruining vineyards at the end of the 1880s, and as a result the vinicluture and wine trade that the town had built its living upon were destroyed.In spite of this, at the turn of the century, public utility services were introduced in the town, new roads were built, trees started to be planted, and the town was steadily growing prettier.On 21st May 1917. a spark from the hospital’s laundry section kindled a fire that set town in flames. An enormous raging fire broke out which demolished most of the town destroying 549 houses and 1400 outbuildings. 11 people were killed in the catastrophe, and more than 8000 were left homeless. Extinguishing was made more complicated by lack of water, which resulted in water being carried there in tank wagons by rail, but the town’s wine storages were also being used for extinguishing. Two days after the fire Charles IV and his betrothed paid a visit to the town. The king gave out an order for reconstruction and supported this process with the donation of a large sum, too. A nation-wide collection was called for the rebuilding of Gyöngyös, which eventually started after the First World War after the plans of László Warga, professor of architecture. The visible result of this is that the town looks attractive today. After 1945 Gyöngyös spread in directions outside the town centre; that was where new neighbourhoods were built, so the relatively small centre could keep its charm and atmosphere. We start our sightseeing walk in the centre of the town, at the Main Square, which was called „Market Square” ( Piac Square ) for centuries. It got its present look after the fire in 1917, when it was renovated and in 2000, when it was reconstructed. The old town hall used to stand in the sometime Market Square, along with the medieval homes of rich townspeople. These buildings in their present reconstructed form, give a unique, uniform and relaxed look to the town, nowhere else to be found in Hungary. 10, Main Square, the two-storey baroque building of the old Grassalkovich House gives home to the Town Library today. 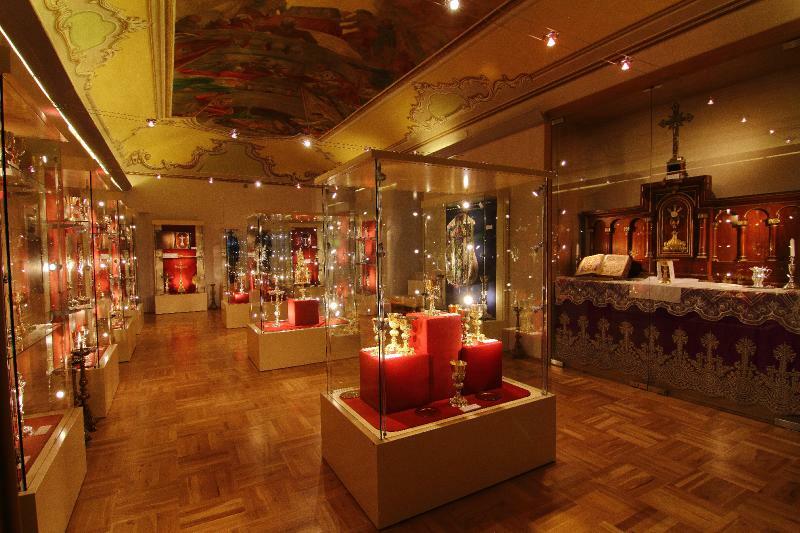 It also gives home to the permanent exhibitions of Herman Lipót’s paintings and the Huszár Lajos Coin Colection, with its special numismatics pieces. If we take a look above its facade, we can see the fancy, baroque family crest of the Grassalkovich family. In front of it, the 11, Main Square, the classicist-styled Orczy House is the home of special values. The revealed gothic hall from the XV. century is the oldest memory of the secular architecture in Gyöngyös. In its neighbourhood, 13, Main Square stands the Town Hall. On its facade there is the coat of arms of Gyöngyös, with the main motifs of the golden sun, the crescent moon and the wolf. These decorate three of the fountains built in 2000 at the four corners of the square. The fourth motif of the fountain at the square’s southeastern corner is the wine. This is an indication to the name of Gyöngyös: „ The town of grapes and wines.”.Gyöngyös got this name in 1984 and since then it uses with pride. In the southern part of the square, ont he stone kerb of the well found during the reconstruction one can see the engraved crests of the sister towns of Gyöngyös: Ringsted in Denmark, Zeltweg in Austria, Kézdivásárhely in Romania and Pieksämäkki in Finland and Sanok in Poland. All of the fountains were made in 2000, during the Hild-award renovation. Standing in a small park 150 metres south of the square is the statue of the „The Hussar examining his sword.” from the World War I. The statue by Zsigmond Stróbl Kisfaludy was erected in 1932 by the municipality, in memory of the 6th ( Würtenberg ) Hussars, fought in the eastern front line in the war.At the pedestal of the statue we can read the names of Galician settlements. Walking on through the Rózsa, then the Kőrösi Csoma Sándor Street we can find the so called County Hall on the other side of the Gyöngyös Stream. The County Hall is a huge, two-storey baroque building, designed by Fellner Jakab. 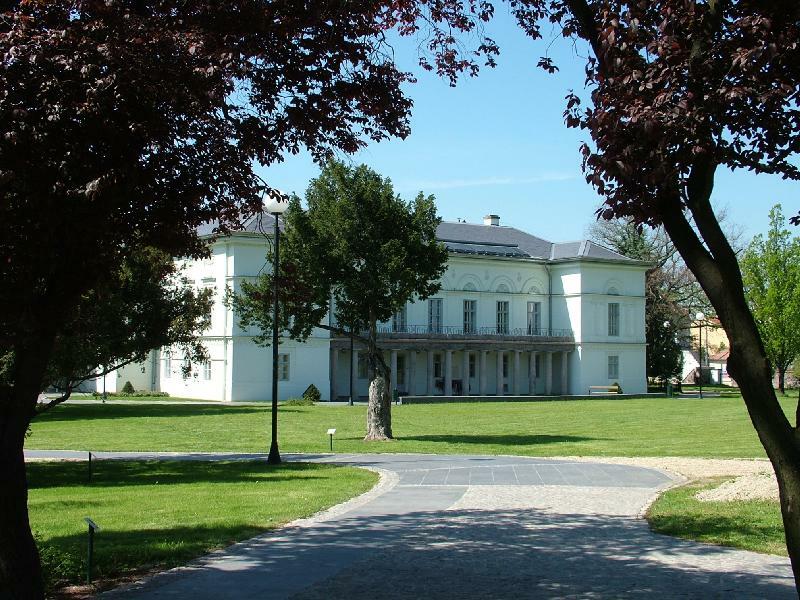 It was built in the 18th century by the county, functioned as a barrack and was the accomodation of Hertelendy Gábor’s palatine hussar regiment. The last tenants of the building were the Würtemberg hussars, we have already mentioned at the Hussar statue. It gained its final form in 1929, when the Ministry of Agriculture bought the building to use it as a state stud. That is why we often call this building „stallion barrack”. Before going further, take a look at the main entrance with the balcony, above it we can see Heves County’s old coat of arms. Opposite the County Hall , on the eastern bank of the Gyöngyös stream stands a synagogue, which was built in classicist style between 1816 and 1820 by Károly Rábl, a native to the town. This is functioning as the home of the Municipal Television. On the walls of the synagogue, the town set a nice memorial tablet to the memory of the Jewish victims of the World War II. The neighbouring new synagogue was built in 1930 and was designed by Lipót Baumhorn and György Somogyi. In the centre of the basilica-systemed building stands an enormous dome. A szamárhátíves ajtó és ablaknyílások, a pártázatos párkányok, a sok kis kupola nagyon dekoratívvá teszik az épületet. Unfortunately, most of the Jewish community of Gyöngyös, which was 2071 people in 1941, died in Auschwitz, so after the war the bulding was not used any more. Walking through the Puky Árpád Street w eget back to the Main Square. We are going into an northern direction on the odd side of the square, and after the Town Hall and the Orczy House we get to the 9, Main Square. The General Bank of Heves County had the building built by the deigns of Valér Mende in 1911. This was one of the first reinforced concrete buildings in Hungary. Nowadays, the building functions as a Soldier Casino. Now we are going to the 8, Main Square, which is opposite the Casino. This was János Almásy, deputy-lieutenant’s home. As the memorial tablet shows on the facade, this was the assembling point of the county’s residents who went to the Rákóczi War of Independence. 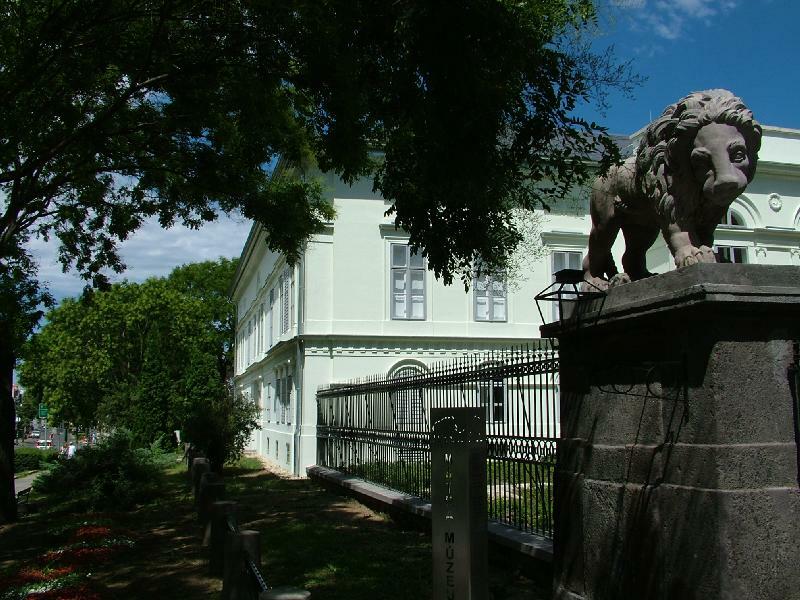 The house, which was renewed several times in the last 200 years, from 1883 was in Kolos Hanák’s property, who was not only the judge of the supreme court, but also a freeman of Gyöngyös. We can see his monogram ( HK )on the wrought-ironed balcony grating. We continue our walk to the 2, Main Square. 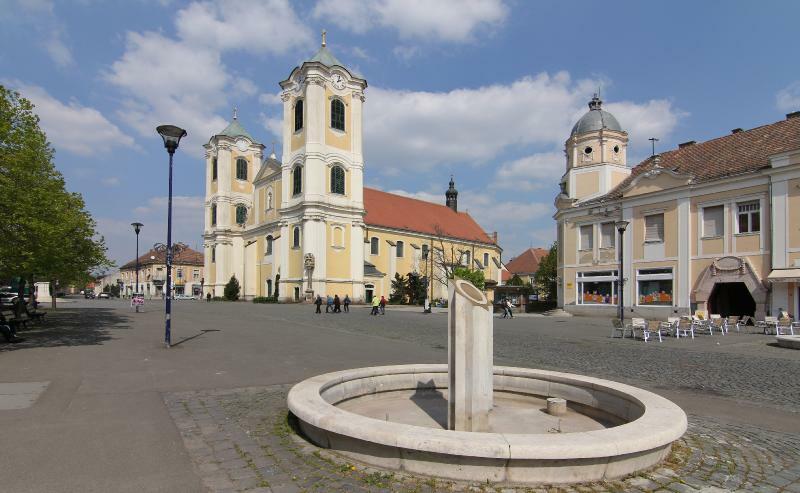 Int he northern part of Main Square, in four-road crossing one will find the impressive two-steppled Saint Bartholomev Parish Church, the „Big Church”, which in today’s form is in baroques style. A church of a lot smaller size stood once in its place in the second half of the 13th century. It was enlarged around 1350, by the landlord of Gyöngyös, Tamás Szécsényi, then it was rebuilt into a gothic halled church at the end of the 15th century. This was one of the biggest gothic halled churches of Hungary. Its special ground-plan is called axial-pillar style. The gothic twin windows on both sides of the apse can be seen today, which was opened up in 1992. Beside this there is a relic of the old bell tower built to the southern nave. Here, in the southern part of the nave, in a little niche we can see Tamás Szécsényi and his wife’s joined crest from 1335. The old church came to be rebuilt in baroque style between 1746 and 1756. The steeples were added somewhat later, the northern one between 1772 and 1773, and the southern one in 1815. The church suffered serious damage in the fire of 1917, after which the steeples were clad on their more simple present form. The rebuilding of these is still on the agenda. In the northern part of the church, the basement walls and gothic-stamp brick-tiled interior of the gothic Saint Anna chapel was found. We go inside the church through the southern gate. A simple memorial bell at the southern side gate holds the memory of the 1917 fire.In its entrance-hall we can see an other relic, a carbonized beam. 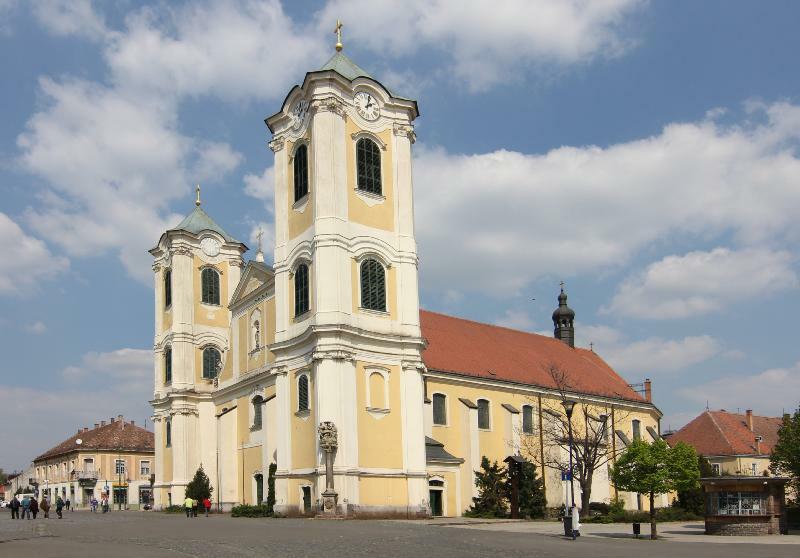 Here two memory tablets was settled, one for János Hám,who was the benefactor of the church and town, and the other is for Pál Bozsik,the bishop who rebuilt the church after the fire. 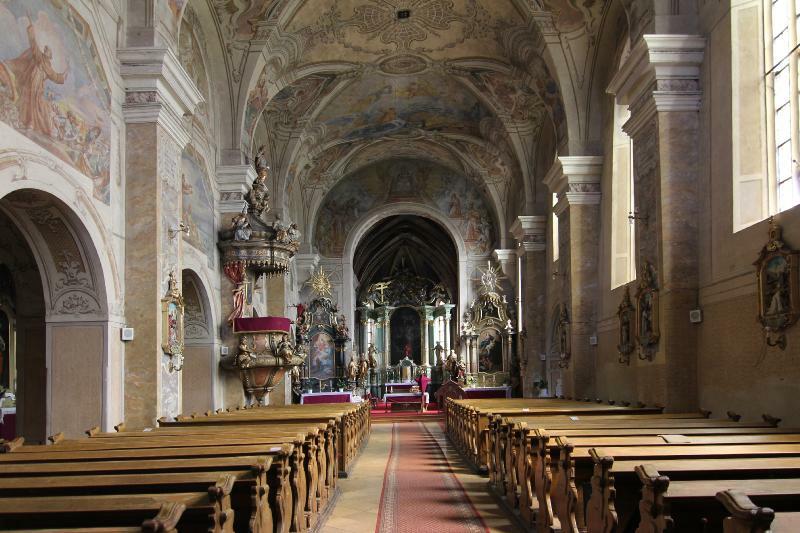 The baroque, unified furnishing of the church was made int he 17-18th century and could survive the fire. The baroque high altar is the work of Gábor Kranowetter from 1773. It shows the martyrdom of Saint Bartholomew. 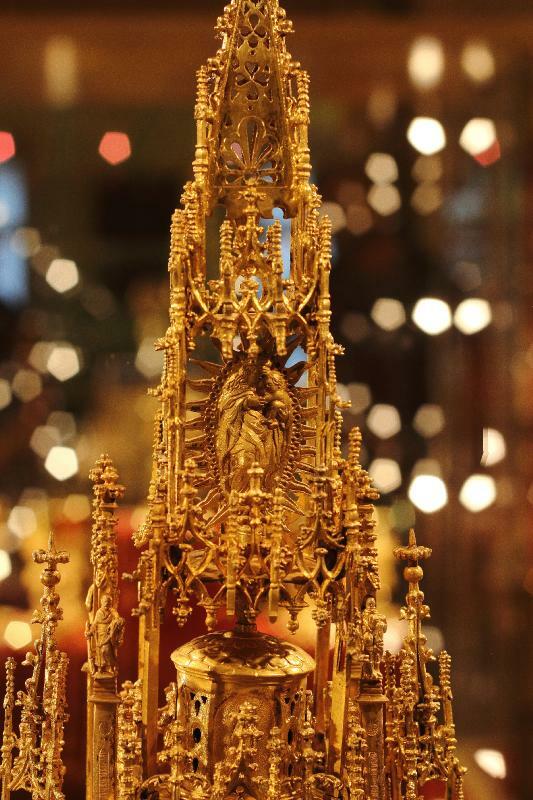 There is a special curio in the southern side of the shrine,a gothic, bronze baptismal font from the end of the 15th century.In the crypt the members of the Almássy and Orczy Family are buried. From May, 2005 a new relic was added to the church. Next to the statue of Blessed Charles IV, a sunk relicholder got place, which symbolizes a glory. It contains a splinter of bone of the King’s rib. This is one of the 14 Hungarian memorial places of Charles IV. King Charles Robert’s full statue stands on a column at the brim of a round paved square built in the year 2000 just across the western main entrance of Saint Bartholomew Church. The statue shows him with a crown on his head and with an orb and a lily sceptre in his hands. Ont he column shaft is the town’s old coat of arms under which one can read the starting lines of the certificate granting a town’s rights to the settlement. The statue, made by Pál Kő, was raised by the town in 1984 for the 650th anniversary of its acceding to a town’s rank. Next to it, the town ordered a new statue by Pál Kő for the 1000th anniversary of the foundation of the state.This shows King Saint Stephen.Behind the king statues, int he middle of the park, there is a fountain with a lion head on it, which was made for the 650th anniversary of Gyöngyös. It is the work of István Máté,a sculpture, who erected the statue with several important historical events of Gyöngyös on it. 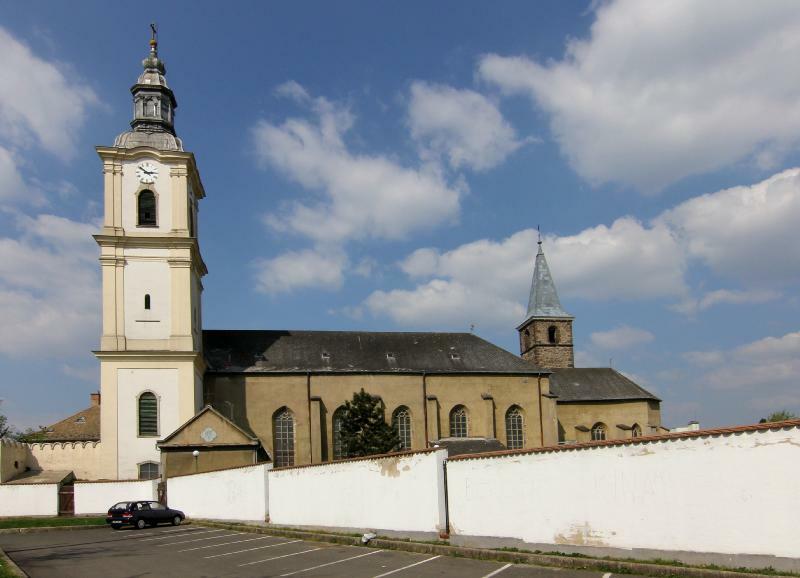 East of Saint Bertholomew Church, behind the gothic apse, right in the Saint Bertholomew Street the visitor will find a one-storeyed baroque building of what used to be the Jesuit, and following that the Fransiscan secondary school, and which today houses the János Pátzay Music School. From 1634 the education is continuous in the school, here studied several well-known people, such as János Hám, a bishop from Szatmár, József Bajza, Pál Bugát, the Vachott brothers, Ignác Török and Gedeon Richter. It was built in 1752 but rebuilt several times. In the niches in its eastern facade shows the copy of the baroque wooden statues of Saint Ignatius on the left and Saint Francis on the right.The original ones are on display in the Mátra Museum. In front of the facade one shall see an 18th century statue of Virgin Mary. This was often called Eastern Mary by the residents, because of its eastern siting. South of the statue of Virgin Mary, at 3 Szent Bertalan ( Saint Bartholomew ) Street is the Upper Town Parish Office, the sometime Almássy House, or as it is widely called, the House of the saint Crown. The first storey of this building, which was built in 1784, was where the Hungarian Crown was kept and guarded on three occasions between 1806 and 1809. The capturing painting ont he ceiling of the big hall upstairs will not fail to remind us of that. This building is the property of the Saint Bartholomew Parish from 1934. Here got place a unique collection, which shows the significant tresures of the church, collected during several centuries. It is a fortune that we can visit these pieces, because during the World War II, there were 3 clerics, who hid the tresures under the southern steeple from the Soviet troops. They swore that they keep the place of the tresures in a secret till the troops are in the country. But the Soviets stayed for a long time, that’s why the last cleric, who was alive, told the secret in his death-bed. 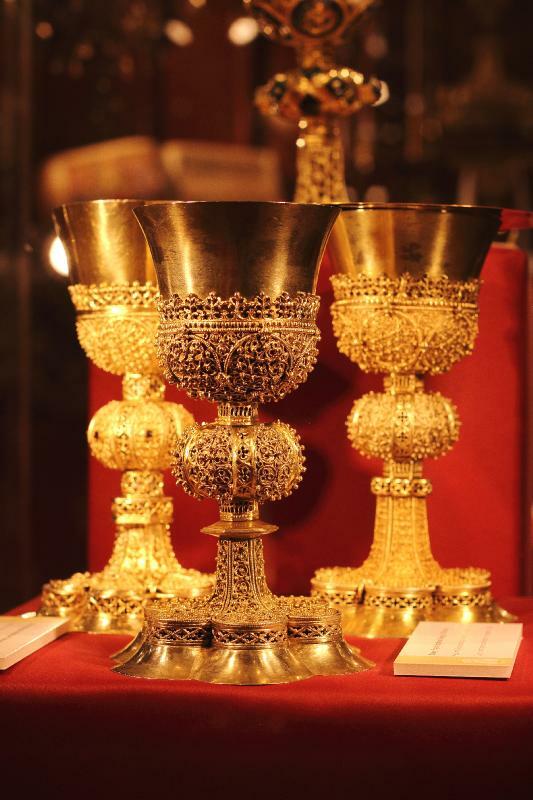 In richness of the Tresury of Saint Bartholomew Church is the third most significant church tresury in Hungary, which can boast service clothes, books, statues, and, among other things, with 43 pieces of goldsmith works of art which includes 12 medieval cups and service vessels. From the Tresury we continue our journey, we walk beside the monument, made for the 50th anniversary of the 1956 Revolution, and we get to the Lajos Kossuth Street. At the beginning of the street we find the neobaroque building, which was built by Gyula Wälder’s designs, who was a university professor. It was built after the fire between 1924 and 1925. In a part of this bulding, theres is the Fire Department. On its facade we can see the statue of Saint Florian in the Tűzoltó Street. The parts of the building in Kossuth Street were originally, the house of the Hungarian National Bank, nowadays there are various offices in it. Walking down in the most crowded street of Gyöngyös, we can examine the typical building style of Gyöngyös, which is called: „zsákközös”. From these, only a few remained in its original style, on the northern part of Lajos Kossuth Street we can see some examples. We have to mention when speaking about the Lajos Kossuth Street, that János Hám, the bishop from Szatmár, was born here in 19, Lajos Kossuth and in 18, Lajos Kossuth lived Sándor Párvy, the bishop from Szepes. Probably this is the only street of the country, which gave two bishops to us. 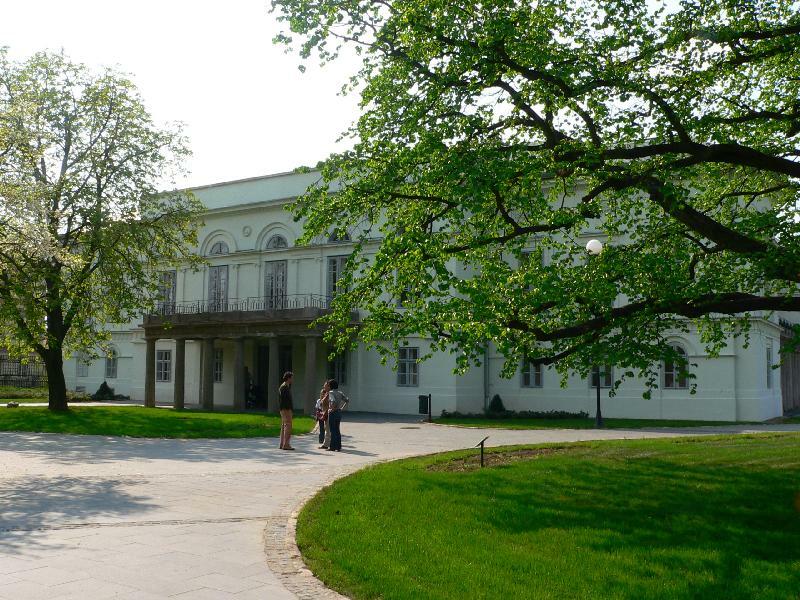 Crossing the Mátrai Street, through the Kossuth Street we get to the Orczy Mansion. At the corner of Kossuth Lajos Street and Koháry Street the kind visitor can see Saint Elisabeth Church, which was built between 1775 and 1779 upon medieval foundations.Behind its simple baroque facade, under the shrine lies a crypt, which has been excavated in the course of the restoration process. 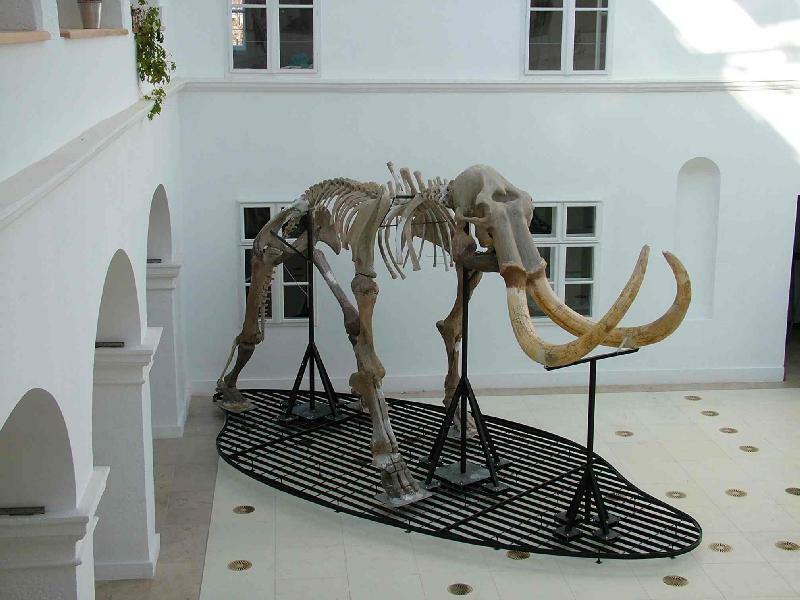 (this can be seen in the Mátra Museum). The church played an important role in the town’s life, mainly in the 18th century. This time a lot of originally Lutheran Slovakian people were settled here. 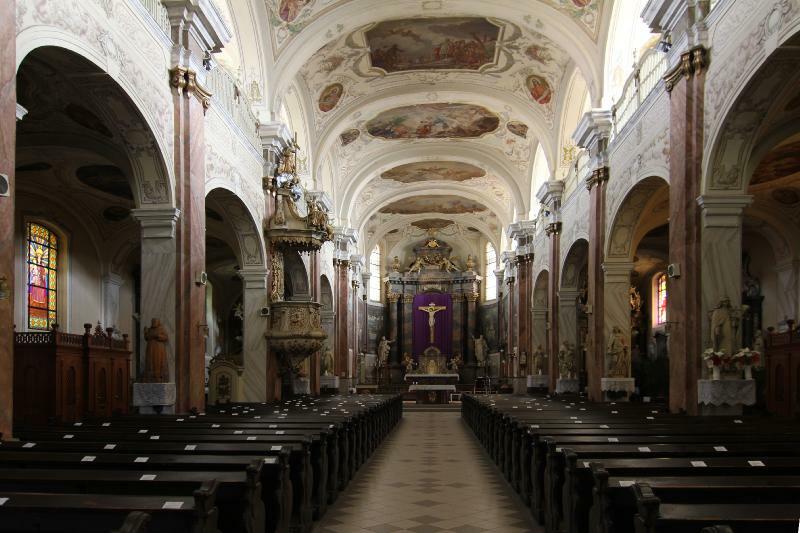 Here, the Fransiscan monks hold their masses in Slovakian language to them. The destiny of the church in the 20th century was also strange. The building, which was a student church for a long time in the first period of the century, was renovated in 1933-34. Lajos Márton, a painter painted it, but after that the church was destroyed by a bomb. After that, it stood empty, was used for storing until 1994. This is outside the old townborder. The old ispotály was built here, south of the church. The downstairs of it was rebuilt in 1761, in its facade, in a niche we can find a nice, baroque Saint Elisabeth statue. Here, poor and wreck people were tended here, then it functioned as a school for more than one and a half century. Today its renovation is on agenda. Now, we are passing by the Winepalace ( Borpalota ), which was built by the Winemaker Co-operative Ltd of Gyöngyös and Visonta. Before this, here stood the Oroszlán ( Lion ) Inn. The eclectic ,beautiful building was opened in 1907. The cellar, under the building was able to store 40 000 hl wine this time. Today, we can find here the biggest winery of the town. In front of the house, in a park, we can see the bronze-statue composition of Sándor Kligl,( a sculpture from Szeged ) with the title: „Workers of the winery.” The statute was unveiled in 1988, in the morning of the harvest procession at the Búza Market as it was called some time ago. Gyöngyös wanted to erect a monument to the memory of the citizen’s ancient craft with this. They wanted to erect monument to the memory of those, who worked with the typical tool, used in wineries, often called „The hoe of Gyöngyös.”. Passing by the Bus Station, we go on in the Koháry Street. This is one of the most important bus junction in the country. We turn from the Koháry Street to the Than Károly Street, where we can find the enormous, white building of the Fransiscan Cloister. The Fransiscan Parish Church and cloister form an impressive group of buildins in the south-eastern part of the centre of Gyöngyös. According to the tradition , the Fransiscan monks were settled in Gyöngyös by the Szécsényi Family, int he 14th century. Probably, this was the time, when the first monastic quarters were built. „The Blessed Woman with the sickle” ( Sarlós Boldogasszony ) was the patron of the church, which was rebuilt int he 15th century. According to the Bakócz codex, the medieval gothic buildings were finished in 1494. They were devastated by the Turkish forces in 1526 but the Fransiscans rebuilt them in 1531. In the 18th century the church was rebuilt, in baroque style by the plans of Giovanni Battista Carlone, Italian architect, but its one-nave gothic style was retained. The spectacular late gothic vaults of its shrine can still be seen today. Next to the church, a one-storey, still whole cloister was also rebuilt this time into one of our biggest Fransiscan monastic quarters,between 1701 and 1721. In 1788, II. Josef wanted to end the cloister life of Gyöngyös, but Earl Károly (Charles) Eszterházy, bishop from Eger could save it. He made arrangements and assigned the Fransiscans with parish missions. From this time we can speak about Uppertown and Lowertown Parishes in Gyöngyös. On 16th August in 1904.,the fires which Gyöngyös was often smitten with destroyed not only the roof of the church, but also the two towers ( the bells remained from 1529 and 1532 ) and the cloister. The renovation was made by the plans of Frigyes Schulek and Kálmán Lux. Then the church was destroyed again int he fire of 1917, the members of the cloister were, who saved it from the total destruction. Its renovation started in 1920 and lasted for 17 years until 1937. 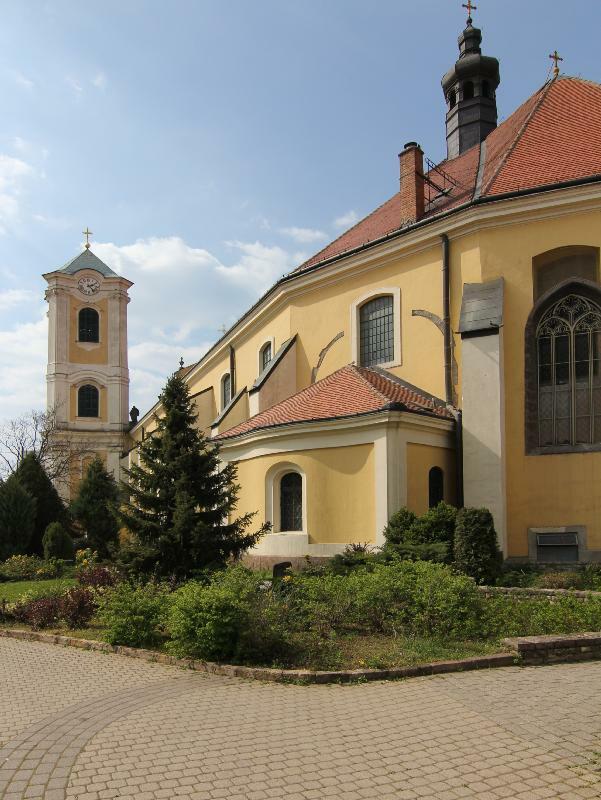 The „nice church” as it was called by the townpeople was blessed by István Zadravecz bishop. If we take five steps down on the stairs, through the main entrance we get into the premises under the choir. Here we can find a long, light nave, which has a gothic overall view, beside its delightful, baroque arch. 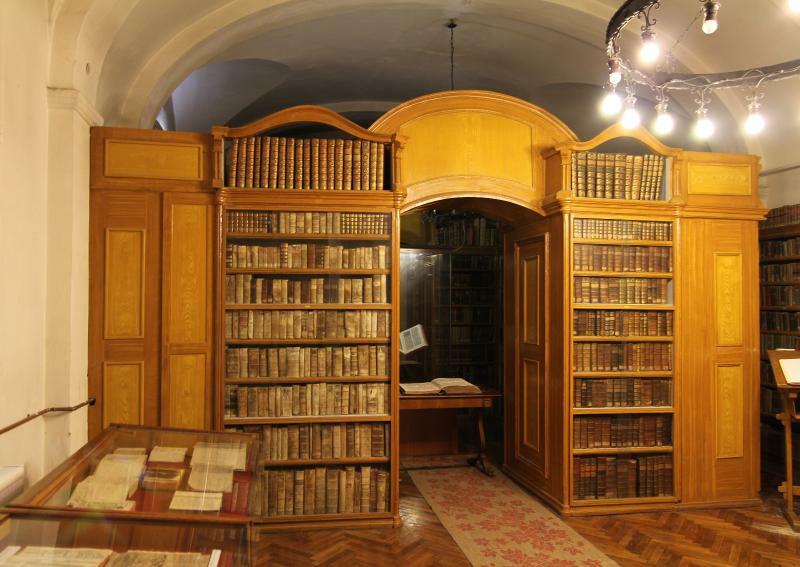 As we enter through the ornamented cloister gate by the main entrance of the church, we find ourselves in the southern section of the building which houses the Fransiscan Library, an invaluable storage of 16,000 books, many of which are original. A permanent exhibition introduces us to the life of the Fransiscan Order int he foyer of the library. 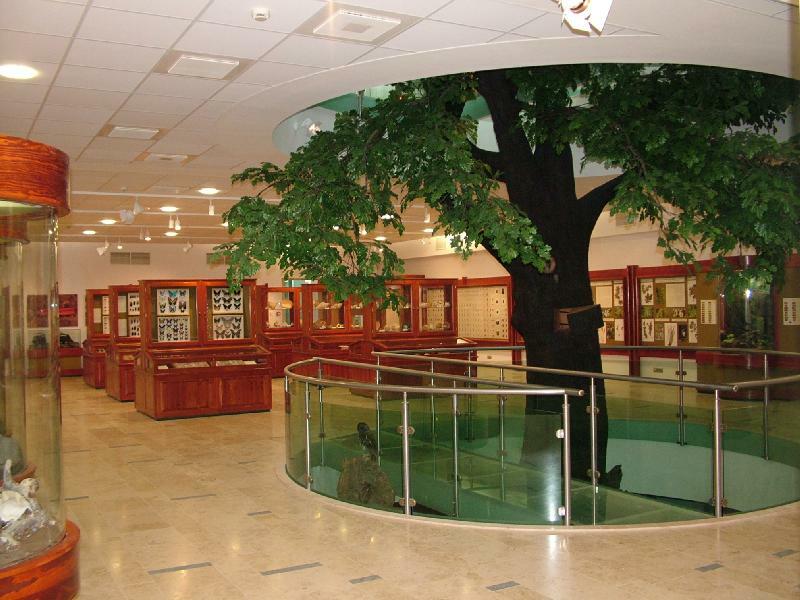 What is also worthy to of the visitor’s attention is the 50 square metre stained glass window in the foyer of the Mátra Cultural Centre, built in 1978. The motifs of the life and history of Gyöngyös and the Mátra appear on this window in glowing colours. In the centre of the picture we can see a phoenix’s recovery from its ashes, this symbolizes that Gyöngyös could always recover and was rebuilt after the fires.